Copyright: © 2019 Andreazzoli F. This is an open-access article distributed under the terms of the Creative Commons Attribution License, which permits unrestricted use, distribution, and reproduction in any medium, provided the original author and source are credited. Using foods with a proved antitumor protection because of their content of specific phytochemicals. The validity of the PET also in Lymphomas and Myelomas gives us certainty that the reduction of sugar intake has a strong reason. In the same way, some studies on the role of IGF1 confirm that a reduced level of growth factors is very important in this setting. It has been widely proved in fact its role in the development of multiple myeloma cells. High levels of IGF1 are connected to an excessive intake of meat, cow cheese and sugars, the last one through the action of insulin, which is a real growth factor for myeloma cells. Also in the chronic lymphocytic leukemia, IGF1 is seen as a negative prognostic factor. Reducing inflammation and keeping tumor cells from multiplying: in fact, many drugs used in hematology act on inflammatory pathways (ex Bortezomib). Therefore, it is of great relevance to eliminate foods well known as biomarkers of inflammation (C reactive protein and others) such as red meat and at the same time increasing those with proved antinflammatory power. Interference with NF-kB, Bortezomib main function, is also documented for many substances such as turmeric that should be taken into account as useful therapeutic tools. Activating a direct anticancer action: many substances studied for their cytostatic effects on hematological neoplastic cells, come from vegetable foods such as curcumin, epigallocatechin-3-gallate and resveratrol. Conclusion: It seems reasonable to use this nutritional approach to avoid a pro-inflammatory and growth stimulation effect while for a true and effective anticancer action we should make use of concentrated extracts following a specific therapeutic protocol. IGF-1, Inflammation, Nutritional guidelines, Hematological patients. In recent years, pathophysiology is being reinforced by new concepts that have been consolidated in literature and therefore can no longer be neglected. The principle of the allostatic load was born with studies by McEwen in 1998 : this principle has more recently been associated with an increase in overall mortality . Epigenetics  have been clarifying some concepts related to the ability of the pathogenic genes’ ability to be able to manifest themselves according to the surrounding environment, in turn determined by the presence of toxic substances and the availability of active ingredients useful for cell survival. Lifestyle, specifically the type of diet strongly influences the quality and nature of the intestinal microbiota from whose integrity the body’s defense abilities depend. Therefore, these three elements, the allostatic load, epigenome and intestinal dysbiosis contribute to maintaining a state of silent inflammation active. Through food we obtain various elements for cell growth and renewal, as well as active ingredients useful for the correct performance of physiological functions and for the defense against external pathogenic stimuli. Change of daily habits, the production and supply needs of food and the cultural attitude towards it, have provoked two dangerous phenomena for our health: an increase in toxins from food products and the reduction of active ingredients contained within. What has been said emerges from the observation that obesity and chronic-degenerative diseases are progressively increasing  and are affecting more and more young people. It can be stated that a large part of the population, at least in the western world, can be considered to be overfed from a quantitative point of view and malnourished from a qualitative point of view. 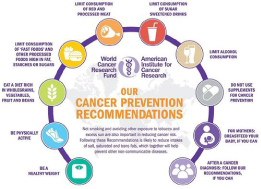 The recent report of the World Cancer Research Fund  (WCRF, see Figure 1), based on international scientific literature, links lifestyle with the increase of cancer pathologies and provides a decalogue of behavior aimed at reducing its incidence. Figure 1: WCRF Recommendations 2018. The fact that the environment can have an influence on diseases is abundantly demonstrated by various studies on migrants, that is regarding populations that permanently establish themselves in places different from the ones of origin and over time acquire the local epidemiological characteristics . The mechanisms of action called into question are numerous. We mention the main ones correlated with food. The presence of leukocytes within tumors, observed in the 19th century by Rudolf Virchow, provided the first indication of a possible link between inflammation and cancer. An inflammatory condition precedes most cancers and beyond specific pathological conditions, obesity itself feeds inflammatory soil through the production of cytokines and growth factors. Transcription factors Nuclear factorkappaB (NF-kB) and signal transducers and activators of transcription 3 (STAT3), two major pathways for inflammation are activated by most cancer risk factors and remain constitutively active in most neoplasms; NF-kB is also activated from chemotherapeutic agents and gammairradiation as well as from hypoxia and acidic conditions found in the tumor microenviroment; conversely gene products linked to inflammation, survival, proliferation, invasion, angiogenesis and metastasis are regulated by NFkB and STAT3 and most chemopreventive agents mediate their effects through inhibition of NF-kB and STAT3 activation pathways. Some other interesting mechanisms by which inflammation can promote tumor effects are recently coming to light. Both commensal and pathogenic microbes are critical regulators of the host immune system and, ultimately, of inflammation. Consequently, microbes also have the potential power to influence tumor progression through a wide variety of routes, including chronic inflammation activation, alteration of the tumor microenvironment, induction of genotoxic responses, metabolism and activate heterocyclic amines of carcinogenic compounds resulting from the diet . Differently, but not less emphasized in scientific literature is the case of endocrine disruptors, those substances of chemical origin used in agriculture and breeding that mimic the effect of estrogen or other hormones within the body and can have disastrous consequences, especially in the early stages of life . Finally, regarding the specific response of the system towards food, we want to underline the importance of Insulinlike Growth Factor-1 (IGF1) as a signal of the inflammatory response of the organism. IGF1 in fact is correlated with a large range of tumors and is high in the case of hyperglycemia, so as to be controlled by the intake of metformin and it also increases as a result of the consumption of cow’s milk and derivatives [9,10]. At the same time, we must consider the protective and therapeutic activities of nutraceutical products available for which the literature provides ever clearer evidence. Among the most well-known polyphenols we mention curcumin, whose anti-tumor action is carried out by inhibiting the growth and migration of tumor cells as well as by the induction of apoptosis ; Epigallocatechin-3-gallate (EGCG) which associates the anti-tumor actions with the antidiabetic effect by its direct action on insulin . Regardless of the origin and type of tumor, it has now been established that both in primary prevention and as a support to a pharmacological, surgical treatment or both, it is considered essential to act on the lifestyle and in particular on the food intake of patients. We believe it is essential to propose to the cancer patient precise food guidelines according to ARTOI (Associazione di Ricerca in Terapie Oncologiche Integrate) protocol (Table 1), based on the indications of the WCRF and on the data emerging from the scientific literature concerning the relationship between food, inflammation and tumor progression. Furthermore, we consider it useful to note that, although not sufficiently justified by the literature yet, to pay attention to the food quality, favoring those products as organic and locally grown as possible. Table 1: ARTOI Nutritional Guidelines. There is now a large range of scientific literature regarding solid tumors but much less clarity in relation to haematological cancer. Changes in glucose and metabolism energy contribute to the altered phenotype of cancer cells and are the basis for positron emission tomography with 18F-fluoro-2- deoxy-d-glucose (FDG) to visualize tumors in vivo. The molecular background of the enhanced glucose uptake and its regulation in lymphoma cells is not fully clarified but some observation has suggested that c-MYC- and PI3K/ mTOR ways could be involved: as matter of fact c-MYC- and PI3K/mTOR-inhibitors decreased viability of the lymphoma cells leading to decreased glucose uptake and expression of glycolysis- associated genes . Moreover, especially in Multiple Myeloma (MM) cells, the role of IGF1 is well studied. The IGF system consists of IGF ligands, IGF receptors, IGF binding proteins (IGFBPs) and IGFBP proteases and contributes not only to the survival, proliferation and homing of MM cells, but also MM-associated angiogenesis and osteolysis. Furthermore, increased IGF1 receptor (IGFIR) expression on MM cells correlates with a poor prognosis. There is some preclinical evidence that indicates that IGF1 is also involved in the development of drug resistance against the current standard-of-care agents against MM, including proteasome inhibitors, immunomodulatory agents and corticoids. It seems that the disregulation of the IGF1 system could involve many of the hallmarks of cancer from sustained proliferation to angiogenesis and resistance to cell death . Despite the prominent role of the IGF system in MM, strategies targeting the IGF-IR using blocking antibodies or small molecule inhibitors have failed to translate into the clinical practice to date. Also in Chronic Lymphocytic Leukaemia (CLL) high IGF1R gene expression is significantly associated with IGHV unmutated status, high CD38 expression, trisomy 12 and del11(q23) and it has been proven as an independent prognostic factor associated with time to first treatment in a CLL prospective cohort suggesting its important role in CLL biology, in particular in aggressive CLL clones characterized by IGHV-UM, trisomy 12 and NOTCH1 mutation . Finally, in acute myeloid leukemia (AML) IGF1 and insulin have demonstrated to promote the growth of human AML blasts in vitro activating the phosphoinositide 3-kinase (PI3K)/Akt and the extracellular signal-regulated kinase (Erk) pathways . IGF-IR expression level positively correlates with the percentage of blasts in bone marrow from de novo acute myeloid leukemia (AML) patients. It has been demonstrated that NVP-ADW742, a small weight molecular inhibitor of IGF-IR, could induce apoptosis in both HL-60 cell line and primary AML blasts decreasing antiapoptotic protein Bcl-2 expression and synergizing with Ara-C to induce the death in a subset of drug-resistant AML specimens . In addition to the use of specific drugs, we believe that lifestyle can have a major impact on IGF1 levels. As a matter of fact IGFBP levels and, inversely, IGF1 levels vary depending on exercise, surgery and nutrition: in particular, some evidence suggests that a Western lifestyle, characterized by low physical activity and high dietary intake, animal protein, saturated fats and rapidly digestible carbohydrates may increase cancer risk through alterations in the metabolism of insulin and insulin- like growth factors and that chronic hyperinsulinaemia may be a cause of cancers of the colon, pancreas, endometrium and also possibly of the breast . These considerations lead us to believe that reducing dietary sugar intake along with animal protein (especially meat and dairy) affects hematological malignancies as already widely demonstrated in breast cancer . The link between inflammation and cancer is also well documented in hematological malignancies. Some mechanisms of its tumor promoting effects have recently come to light. In CLL the robust production of inflammatory cytokines and chemokines accompanied by the activation of intracellular pro-inflammatory pathways and the presence of somatic mutations that activate pro-inflammatory signaling pathways suggest that chronic inflammation plays a pathophysiological role in this disease. Indeed, glucocorticoids and non-steroidal anti-inflammatory drugs possess anti-tumor activity and glucocorticoids have been broadly used to treat CLL and its complications. Many inflammatory pathways are involved in cancer and are a target for specific drugs. For example, in Multiple Myeloma and Mantle Cell Lymphoma, the use of Bortezomib is based on the upregulation of NOXA, which is a proapoptotic protein and on the suppression of the NF-κB signaling pathway resulting in the down-regulation of its antiapoptotic target genes ; NF-kB is also a transcriptional activator of inflammatory mediators such as cytokines. Inflammation of bone marrow (BM) microenvironment and STIM1 and STIM2-mediated BM necrosis affect erythropoiesis and are negative prognostic factors in T cell acute lymphoblastic leukemia (T- ALL) . Based on this evidence we can assume that an inflammatory state is probably the main factor favoring tumor growth and we believe that an anti-inflammatory diet can make a contribution. Read meat has demonstrated to be significantly associated with higher C-reactive protein and lower adiponectine levels, especially in individuals with high BMI , as well as with TNFα; optimal weight control together with the elimination of these foods could contribute to a reduction of the inflammatory pattern. Red and processed meat consumption may also increase insulin resistance and oxidative stress whereas high intake of whole grains may provide protection by improving insulin sensitivity, lowering insulin and glucose levels and by inhibiting inflammation and oxidative stress . Leukemia cells contain relatively elevated levels of reactive oxygen species (ROS) due to alterations in proand antioxidant pathways which can promote genomic instability, survival and growth signaling. For this reason, in addition to limiting foods with oxidant action, we propose to increase the comsumption of foods with proven antioxidant and anti-inflammatory properties, such as vegetables belonging to the cruciferous family and spices such as curcumin. In view of the close link between microbiota and inflammation, we believe that a high-fibre diet can improve the intestinal microenvironment and consequently immune function. Moreover, there is continuous dialogue between the haematopoietic system and the microbiota whose imbalance could exacerbate inflammation as well as haematopoietic alterations; systemic recognition of microbiota-derived products by TLRs is necessary to maintain a sufficient pool of BM myeloid cells  and this could contribute to a higher infectious risk during post-chemotherapy neutropenia. Finally, disruption of homeostasis in the microbiota is associated with clinically significant outcomes in patients with hematologic disorders; it plays a role for example in GVHD, allo-stem cell transplantation  or response to cyclophosphamide . Many foods, especially from the plant world, have been shown to contain substances called phytochemicals with proven antioxidant and anti-tumor activity. Although it is reasonable to use concentrated extracts of these substances for effective therapeutic action, introducing these foods into the patient’s daily life can also make a contribution to the reduction of the anti-inflammatory medium and to better tolerate chemotherapy. In the haematological setting, many substances have shown such activity as for example curcumin, resveratrol, epigallocatechin gallate and sulforaphane. Curcumin, one of biologically active constituents of turmeric, has a pleiotropic action that is mainly expressed through the inhibition of NF-kb and STAT3; it specifically has a hypomethylating action on myeloid leukemia cells in vitro and in animal models ; it also shows synergy of activity with some chemotherapeutics such as etoposide, arsenic trioxide and cytarabine. It inhibits RANKL mediated osteoclastogenesis in MM. Finally, it is a chemosensitizing agent increasing, for example, the cell sensitivity to daunorubicin and to busulfan. These are just some of the results demonstrated in haematological diseases but justify, in our opinion, its use as a drug, included as part of the patient’s daily diet and moreover contributing to a variety of his microbiota . Resveratrol and polydatin, its more available glucoside, are phenols contained in many plants such as in the grape seeds. In acute myeloid leukemia it has been shown to induce independent FAS apoptosis and downregulation of BCL2. It reduces the cardiotoxicity of arsenic trioxide and levels of IGF1. It showed synergy with Bortezomib and Thalidomide, while also inhibiting the constitutive activation of STAT3 and NF-kb . Sulforaphane is an isothiocyanate contained in plants belonging to the cruciferous family. It modulates some intracellular signals such as MAP kinase and cyclin B1, as well as being involved in the inhibition of histone deacetylase and COX2. It has a similar action to Bortezomib in inhibiting the degradation of IkB and shows synergy with many drugs active in MM such as doxorubicin, melphalan and the same Bortezomib . In many studies, the main active compound of green tea, epigallocatechin gallate has manifested antitumor activity in particular in MM, CLL and AML; in the latter its effects is accompanied by the inhibition of FLT3, if mutated . It also protects cardiomyocytes from doxorubicin toxicity. Although it appears useful to advise the patient to drink green tea, it should be prudently avoided due to the documented antagonism between the two molecules in the case of Bortezomib treatment . These are just some of the compounds contained in plant foods with anti-inflammatory, antioxidant and anti-tumor action. We believe that it is beneficial for the patient to pay attention to his/her daily diet by increasing the ingestion of foods that help the body in countering the side-effects of chemotherapeutic drugs as well as in determining epigenetic activity. Nowadays, when it comes to primary prevention, the relationship between food and cancer is well known. Less known is the concept of using a useful food model even after cancer diagnosis and during therapy. The WCRF advises to follow the recommendations made not only to prevent the onset of the disease itself but also once the disease has been diagnosed. The ARTOI nutritional guidelines are based on these principles and are used in clinical practice with solid tumors. A great number of scientific evidence legitimize us to use it in haematological patients as well in which the rationale is to reduce chronic silent inflammation, reduce the supply of sugar and growth factors to the organism, improve the function of the microbiota, by ingesting food containing antioxidant, anti- cancer and anti-inflammatory substances. These substances can also become a real therapeutic tool, together with conventional treatment, when used as concentrated extracts in order to receive the maximum benefit from the therapy while improving the patient’s quality of life.